The first class resort of Reunion, located just a 20 minute drive from the entrance to Walt Disney World Resort has become one of the most sought after resorts in Orlando and offers something for everyone. Reunion has become one of the most sought after resorts in Orlando and offers something for everyone. This first-class resort is perfect for enjoying all the sights and sounds of Orlando, located just a 20 minute drive from the entrance to Walt Disney World Resort. In addition to three world-class signature golf courses, an amazing selection of amenities are available, all set amid vast, pristine landscaped gardens. The rooftop lounge, Eleven, serving tapas is the perfect place to end a busy day, with amazing views across Walt Disney World Resort and the firework displays. The three magnificent 18 hole courses at Reunion are wonderfully varied, ranging from the hilly landscapes of the Legacy course to the smooth and sweeping fairways of the Tradition course and the large greens of the Independence course. A golfing academy and equipment hire are also available. Demanding a well thought out approach from every player regardless of skill level, The Independence course puts a premium on a solid short game with spacious green complexes where club selection can vary from putter to lob wedge to three-wood. Please note that opening times may vary depending on the season, and daylight hours. Tuition Take your game to the next level by learning from the highly trained staff of experienced PGA Professionals at Reunion. Whether you’re a beginner or an accomplished player, their staff will be ready to teach you the skills necessary to improve your game. Home to the Annika Academy, providing individual instruction, personalised fitness and nutrition programs, as well at the Frankly Putting PAD, dedicated to improving your performance on the green, regardless of skill level, to learn to putt better in a relaxed environment with the help of cutting edge technology. Lessons and courses available for both juniors and adults. Dress code Club casual and golf attire. No tank tops, T-shirts, sweat pants, warm-up suits or denim. Only soft-spiked golf shoes may be worn on the golf courses. Located on hilly terrain, this course boasts dramatic elevation changes creating a unique variety of golf shots. 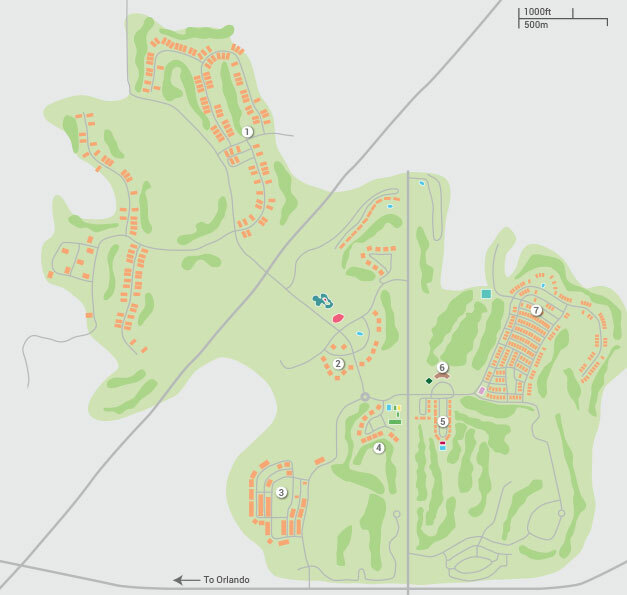 There are 6 tee locations on each hole, a variety of natural preserve areas, generously wide fairways and strategically placed bunkers across all eighteen holes. Please note that opening times may vary depending on the season and daylight hours. This Parkland-style course is quite flat and flowing, with elevated tee boxes and greens. Designed to tempt golfers into hitting risky shots with potentially big payoffs, this course challenges the golfer to step up to the ball with a carefully organized series of shots in his or her mind. Please note that opening times may vary depending on the season and daylight hours. Open all year round, Tuesday - Saturday, from 8am - 5pm. Sundays from 8am - 2pm. At Reunion, you can experience fantastic tennis facilities at the award-winning complex. The extensive facilities on offer include six floodlit hydro-grid courts, offering you the chance to enjoy a few great matches. Equipment hire and a tennis academy are also available. Open all year round, 7 days a week, from 7am - 11pm. The gym facilities at Reunion offer state-of-the-art technology and equipment whether you wish to enjoy cardiovascular or weights training. On this high-tech equipment you can even check your email whilst you’re working out on the treadmill. Various fitness classes are also on offer. The popular Kids Crew club offers a great variety of fun-filled activities for children aged between 4-12 years. Activities range from scavenger hunts and nature hikes, to pool-based activities. Open all year round, Tuesday - Saturday, from 9am - 4pm. The cost for a half day (9am-12pm or 1pm-4pm) is approximately $50 per child, with lunch costing around $10 per child. For a full day the cost will be approximately $60, including lunch and two snacks. The resort also offer 10% off for additional children. Reservations required 24 hours in advance. The tranquil environment provided by the treatment rooms, veranda and suites of the Reunion spa is the ultimate place to escape to. Here you can enjoy a superb range of massages, skin and body treatments to help you totally unwind. You’ll love the fantastic, fun-filled swimming pool complex at Reunion. Here you will find a wide range of water-based activities including slides, water playgrounds, a lazy river and much more. You’ll also find a number of communal pools shared by the villas. Cuisine that can be enjoyed at Reunion’s different food outlets includes worldwide dishes, traditional American breakfast, and also Caribbean-influenced foods. The Grande Lobby Bar also offers sushi and light bites. The rooftop lounge, "Eleven" enjoys panoramic views of the resort and is worth a visit in the evenings to take in the firework display at Walt Disney World. This glamorous year-round indoor-outdoor roof top lounge offers stunning views and handcrafted cocktails. Eleven's steakhouse menu showcases prime cuts of beef with rubs, sauces, and other enhancements available to add to your choice cut, from a 8oz Filet Mignon to a 22oz Porterhouse! For those looking for something other than beef, the menu has a lot more to offer, from Shrimp & Scallop Linguine, Cabernet Braised Short Ribs to Crisp Wild Striped Bass. Prices for a main course range from approximately $24-$45. Serving traditional Italian cuisine in a warm and rustic atmosphere, from hearty pasta dishes, fresh seafood to delicious meat dishes. Forte offers diners one of the state’s finest and most impressive wine cellars with more than 250 selections from around the globe. Prices ranging from approximately $13.95-€35.50 for a main course, with many of the meat and pasta dishes served in half portions, ideal for children, starting from around $7.95. Serving a wide variety of traditional American breakfast and lunch options, the Clubhouse is the perfect place to get together and grab a bite to eat or have a few drinks. Dine indoors or out – either way you’ll get a spectacular view of the driving range and the first and 18th tees of Tom Watson's Signature Course. Breakfast prices range from approximately $4.99-$13.99, and main course lunch and dinner prices from around $8.99-$25.99. Children’s menus are available. Start your night off with a light snack or a pre-dinner cocktail at The Reunion Grande Lobby Bar offers sumptuous appetizers and freshly prepared sushi on selected nights for your dining pleasure. Overlooking the Seven Eagles Pool Pavilion and the Palmer course, the Cove offers a menu of sandwiches, salads, snacks, and smoothies with the flair of the islands, as well as a full bar with daily happy hour specials. Food prices range from approximately $7.99-$13.99, with children’s and family meal menus available. While you are out making a splash at the water playground, enjoy all-American snacks, from hot dogs, burgers, pizzas and sandwiches. Food prices range from approximately $7.99-$13.99, with children’s and family meal menus available. A small range of shops are available at Reunion, offering a basic range of goods. Shops that can be found on-site include a gift shop, florist, and a grocery delivery service offering a great selection of food and drink. Open all year round, 7 days a week, 24 hours a day - on demand. The resort provide a convenient on resort shuttle bus, which will take you to anywhere on the Reunion Resort.